Diageo Australia has announced that it was recently awarded the 2015 Smart Award for Excellence in Manufacturing Supply Chains for its new distribution centre (DC) in Huntingwood, Sydney, at this year’s SMART Conference. The Smart Awards, a centrepiece of the conference, were presented at The Smart Conference 2015 Supply Chain Industry Dinner on Wednesday 27 May, 2015. 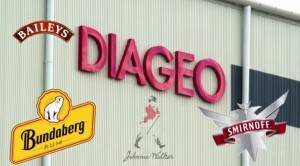 Diageo is a renowned manufacturer and supplier of liquor to retailers and suppliers including Woolworths and Coles. The company’s new “One Touch” supply chain has proved to be a great success, delivering efficiencies that have enabled Diageo to bring distribution back in-house rather than having to outsource to third party logistics providers. The new DC in Huntingwood, located next to Diageo Australia’s primary manufacturing site, consolidated the company’s two Sydney facilities into one. The new DC also features a Dematic ColbyRACK custom designed 31 metre high-bay storage system that provides capacity for 26,000 pallets, more than doubling the DC’s capacity from 10,000 pallets. David Rubie, Dematic’s Manager of Industry Logistics said Dematic was proud to have been involved in the development and delivery of Diageo’s award-winning “One Touch” supply chain and new DC. “Over the past few years, there has been a general trend among retailers and liquor distributors to reduce the level of stock they are holding and to expect ‘just-in-time’ deliveries. It was therefore critical for Diageo to upgrade our supply chain to ensure we were capable of meeting our customers’ needs,” said Joe Russo, Supply Director, Diageo Australia. Diageo’s products are sold in more than 180 countries around the world.